In an age where quality is everything, diversity in nursing is key. ECNO Kelly Hancock shares how nurse leaders can take action within their own organizations to grow and develop a more diverse nursing program. In a healthcare age where quality is everything, diversity in nursing is extremely important. Research has shown that when nurses understand the culture and history of a patient’s community, communication and trust are improved. Furthermore, patients feel more comfortable and confident in the care they are receiving when their caregiver can relate to them culturally or ethnically, thus, improving patient satisfaction. For years, nursing and healthcare experts have been stressing the critical need to develop a more diverse nursing workforce. The Institute of Medicine’s landmark report on the Future of Nursing stated that a more diverse nursing workforce must be part of the solution to achieving health equity. How diverse is the current nursing workforce? According to the 2014 U.S. Census Bureau, 27 percent of employed registered nurses came from racial or ethnic minority groups. In 1992, that number was 11 percent. The Bureau also reports that male nurses only account for 10 percent of all nurses. Increasing diversity is challenging for many reasons, but one of the most glaring is the size of the total nursing workforce in the U.S., which currently encompasses 3.6 million nurses. For example, in 2012, 184,000 registered nurses entered the profession; however, at the time, the workforce was 2.9 million, so overall diversity increased only marginally. While there are a number of local, regional and national associations and organizations dedicated to helping create a more diverse nursing workforce, there are several ways nurse leaders can strategically contribute to enhancing diversity within their own organizations. First, leaders can encourage their employers to not only adequately recruit and retain minority nurses and nursing students, but to also work to ensure that flexible part-time employment and scheduling is available. This helps maintain a more accommodating work environment conducive to the personal lifestyle needs of many minority caregivers. Nurse leaders can also actively promote the creation of an organizational climate that supports diversity. In many cases, organizations with an inclusive culture that encourages collaboration, flexibility and fairness as well as equal participation are more successful in employee engagement and retention. Encouraging buy-in and engaged support by consistently collaborating with other members of the health system or hospital leadership and human resources teams can have a resounding impact on climate change. At Cleveland Clinic, for example, the Zielony Institute partners with the organization’s leadership team as well as the Office of Diversity & Inclusion to help develop and grow areas such as minority demographics and cultural competence. Another area where nurse leaders can make a difference is in education. Schools of nursing and other organizations have done a tremendous amount of work to provide increased educational opportunities for minority groups. In fact, according to the Robert Wood Johnson Foundation (RWJF), in 2014, 30 percent of students in entry-level baccalaureate, master’s and doctoral nursing programs and 33 percent of students pursuing an associate degree were from racial or ethnic minority groups. Additionally, 12 percent of entry-level baccalaureate nursing students and 15 percent of associate degree nursing students were male. With education a strategic priority, nurse leaders can help implement initiatives such as tuition assistance programs that make higher education more affordable and attainable for minorities. According to the RWJF, hospital systems that provide tuition assistance are likely to increase their workforce diversity. Leaders can also identify barriers that minority nursing students face in receiving quality education, and work to remove them. Cost is an obvious barrier, but many racial and ethnic minority groups also commonly face other challenges entering the nursing profession. RWJF offers examples like inadequate preparation in science and math, limited exposure to the health professions, a lack of role models or mentors, or family obligations that hinder full-time study. Additionally, implementing programs that are designed to connect with students before they embark on a nursing education path or start thinking about college is said by many to be a highly successful strategy in increasing nursing diversity. For example, nursing students need to be adept at science and math to succeed in microbiology, chemistry, and other subjects. However, the American Council on Education says students from smaller schools, less resourced communities, first-generation college families, and minority communities are at a disadvantage in this area. Similarly, the National Conference of State Legislatures notes that 41 percent of Hispanic students and 42 percent of African-American students require educational remediation during college while remediation for white students is roughly 31 percent. One initiative Cleveland Clinic, Cuyahoga Community College and the Howley Family Foundation recently launched to connect with nursing students at an earlier age is the ASPIRE Nurse Scholars program. This 12-week high school enrichment program seeks to develop underrepresented high school juniors and seniors for careers in professional nursing. It focuses on providing participants with career information and critical skill sets to support their matriculation through higher education, nursing school, and beyond. No matter how you look at it, the future nursing workforce needs to become more diverse to better meet the needs of future patient populations and maintain health equity. Aside from becoming more involved in local, regional and national diversity efforts, there are many strategies and initiatives nurse leaders can pursue within their own organizations to grow and develop a more diverse nursing program. And every action taken today is certain to contribute to a better tomorrow. 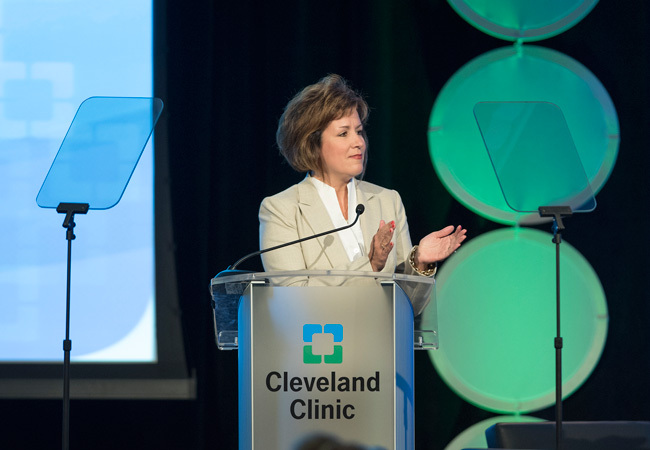 Kelly Hancock is the Executive Chief Nursing Officer of the Cleveland Clinic Health System, and Chief Nursing Officer of Cleveland Clinic Main Campus. Follow Kelly on Twitter at @kkellyhancock.